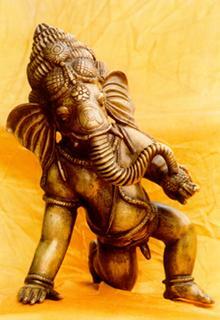 Ganesha is not a Deity of the vedic pantheon. In one of the seals discovered in archaeological excavations at Mohanjodaro and Harappa of the Indus Valley, there is the find of a figure of a ram with a human face and trunk and tusks of an elephant. Thattiriya Aranyaka refers to a Deity called Dentin (one with tusk) who is said to possess a twisted trunk (Vakrathunda). It is not clear whether this Deity had the full form of the elephant or not. Probably this figure was a mixed figure in the pattern of the earlier figure found in the Indus Valley excavations, viz., the ram with the human face and with the trunk and tusks of the elephant. These figures may be the present day Ganesha figures in their embryonic stage. Significantly enough, only the trunk and tusks of the elephant appear to have been taken out for depiction, perhaps for the reason, that even in that distant past they had a special significance as at the present days. To comprehend the full significance of these trunk and tusks we have to study the significance of the elephant an animal existing side by side with human beings from the very prehistoric days. The elephant may have been a totem animal during the prehistoric period. Totemism is supposed to be the earliest appearance of organised religion when the totem animals were worshipped. Some times totem animals were humanised and given great importance. There is a picture in extent, of a piece of sculpture preserved in Paris museum which was excavated from Western Persia. This sculpture is said to be belonging to a period between 1200 B.C. and 1000 B.C. according to L. Vanden Berghe quoted by Fr. H. Heras. The sculpture contains the figure of a man dressed in old Persian attire with the head of an elephant with its trunk turned inward towards its mouth brandishing a sword in one hand while the other hand holds the tail of a serpent crawling towards his feet. If the date ascribed to this find is correct it affords proof that this totem figure was humanised during the period immediately following the Vedic era when Vedas were still being transmitted by word of mouth. Humanising the totem is a step forward in metaphysics and philosophy also for it is the starting point of man creating God heads after his own image or according to his own mental ability and fancies.